The Cayman Islands is one of the world's leading jurisdictions for the establishment of offshore trusts. However, it is not easy for a practitioner to approach the drafting of a Cayman Islands trust instrument with confidence. This eminently practical book solves that problem to near perfection. Arranged as a collection of precedents, with each provision of every precedent explained in detail, Drafting Cayman Islands Trusts, could hardly make the drafting process easier. The drafter learns the advantages and potential pitfalls associated with each provision as he or she prepares to draft it. The authors provide specific language, although individual variations (based on the authors' expert guidance) are encouraged. Are hostile beneficiaries clauses valid? Do automatic flee clauses work? What powers can a settlor reserve? How can STAR trusts be used to protect trustees holding high-risk assets? Would STAR trusts be recognised in other jurisdictions? How can one restrict a beneficiary's right to information and trust documents? Can the appointment of a foreign trustee discharge a retiring Cayman trustee? What indemnities should retiring trustees request from successors? 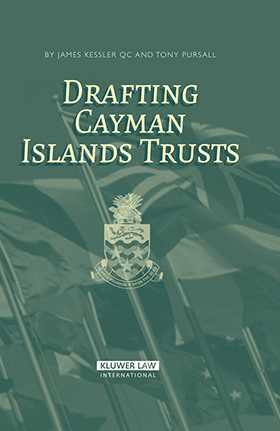 As a systematic approach to drafting Cayman Islands trusts, this book will be of immeasurable day-to-day value to practitioners and administrators alike. James Kessler QC is a leading practitioner at the Revenue bar. He is the author of Drafting Trusts & Will Trusts, Taxation of Foreign Domiciliaries, and Taxation of Charities. He is a founder member of STEP and founder of the Trusts Discussion Forum. Tony Pursall is a Cayman Islands attorney-at-law, who practices from the London office of Maples and Calder. He is a member of the STEP International Committee and of the City of London branch committee of STEP. He is the author of the Cayman Islands section of the World Trust Survey for Trusts & Trustees and is a contributor to the Cayman Islands section of Planning and Administration of Offshore and Onshore Trusts.